Fence lighting serves as security equipment, lighting both commercial and residential areas that need to be protected. Well lit areas are often the best deterrents for vandalism and other delinquent activity. No matter what you are trying to secure, having a lighted fence should be one of your main security features. Fence lighting also provides illumination for walkways, footpaths, and gates or other openings, as well as ambiance after the sun sets to complement landscaping and provide an outdoor living area. With all StoneTree® fences we ensure they are both functional, and beautifully designed. The same is with our lighting, they increase the design potential for each wall, all the while giving additional security benefits. 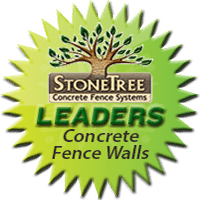 Lighting on StoneTree® Fence Walls is efficient and economical, because the Combo-Cast™ fence wall panels are designed with enough space at the column-end of the panel to include electrical conduit without drilling into the concrete, thereby adversely impacting the integrity of the panel. Electrical conduit is placed in the void portion of the column which wraps around the structural supports of the footings. The StoneTree® Licensed Manufacturer will discuss with the client the style and type of fence lighting required and the purposes for which the lighting is being added to the fence. A selection of appropriate fixtures, as well as their placement, will be recommended for inclusion along the wall. Lighting fixtures may then be installed at the desired locations.